Assembled with pride in the USA. Concourse quality. Technically correct in every detail. 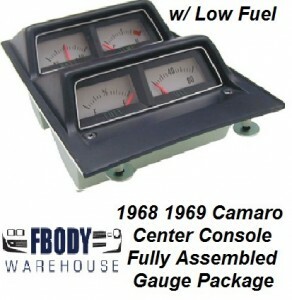 Assembled Gauge Pod includes all our individual, superior quality, faithful reproduction components. USA made Low Fuel module installed as original to the back of the fuel gauge. 1968-69 Module provides a Ground to an indicator light. Fully assembled and tested by our expert staff in-house. Just hook up wiring harness and install in console. Superior reproduction in appearance. Installation hardware included. Officially Licensed GM Restoration Parts.